Caption: Cmdr. 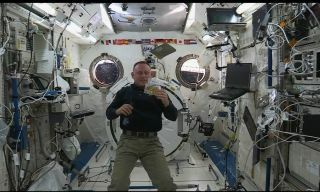 Barry "Butch" Wilmore holds up freeze-dried cornbread stuffing — one of the Thanksgiving food items he and the rest of the International Space Station crew will enjoy this week. Like most Americans back on the ground, astronauts aboard the International Space Station will celebrate Thanksgiving with a feast: NASA food scientists have created zero-g versions of classic Thanksgiving dishes for this week's celebration. The American astronauts currently living on the orbiting laboratory 250 miles (400 kilometers) above Earth's surface — commander Barry "Butch" Wilmore and flight engineer Terry Virts — as well as Italian-born flight engineer Samantha Cristoforetti, will get a day off this Thursday (Nov. 27) to celebrate Thanksgiving. (Watch Wilmore deliver a Thanksgiving greeting in this video.) At mealtime, they'll gather for some "traditional" Turkey Day fare — in zero-g form, of course. "I'm from Tennessee, so I grew up drinking sweet tea — so I've got a little sweet tea as well," Wilmore said in his Thanksgiving video. "So, we're going to have all of that up here and try to share in the spirit of the season." The astronauts will likely share the meal with their newly arrived Russian shipmates, flight engineers Alexander Samokutyaev, Anton Shkaplerov and Elena Serova, who got to the station late Sunday (Nov. 23). The Russians do not have the day off, but crewmembers dine together most days. The orbiting laboratory frequently hosts an international crew, and astronauts generally join in the celebrations of their crewmates. Food aboard the International Space Station is either freeze-dried or thermostabilized (a process similar to canning, but with the food packed in pouches), so it has a long shelf life and can be stored without refrigeration. There are no microwaves or ovens on board the station, so food is heated using warm water. Such storage methods do not work well with all foods, so it can be a challenge to recreate specific dishes. NASA astronauts Michael Hopkins (left) and Rick Mastracchio show off a spread of Thanksgiving dishes aboard the International Space Station in 2013. One Thanksgiving staple, sweet potatoes, may one day be grown in space, NASA officials said. Deep-space missions to Mars, or even more distant destinations, will likely require astronauts to grow their own food. According to NASA, sweet potatoes could be an ideal crop for these missions: They would provide astronauts with energy (from carbohydrates) and beta-carotene, they can adapt to a controlled environment with artificial sunlight, and in addition to the tuber itself, the side shoots from the potato are also edible. Thanksgiving has been celebrated aboard the International Space Station since the first Americans came on board in 2000. The first Thanksgiving in space took place aboard the United States' first space station, Skylab, on Nov. 22, 1973, and was marked by American astronauts Jerry Carr, Bill Pogue and Ed Gibson. On that first extraterrestrial Thanksgiving, the astronauts did not get the day off.